I made a new mesh because I don’t have the raw data that contains the original mesh. As a result the coastlines don’t match up exactly. I made the coastline by looking at the pixel color to determine land vs water. There’s deep water (dark blue) and shallow water (light blue). Some of the set pieces get misinterpreted as lakes. I got elevation data by feeding the coastline into the HTML5 version of mapgen2 (from 2017). The algorithm is slightly different so the mountains don’t line up exactly. I got the moisture data by feeding approximate rivers into the HTML5 version of mapgen2. I didn’t spend the effort to reconstruct the rivers; I just placed a handful of river points when I saw shallow water pixels. This produced approximate desert vs forest biomes. 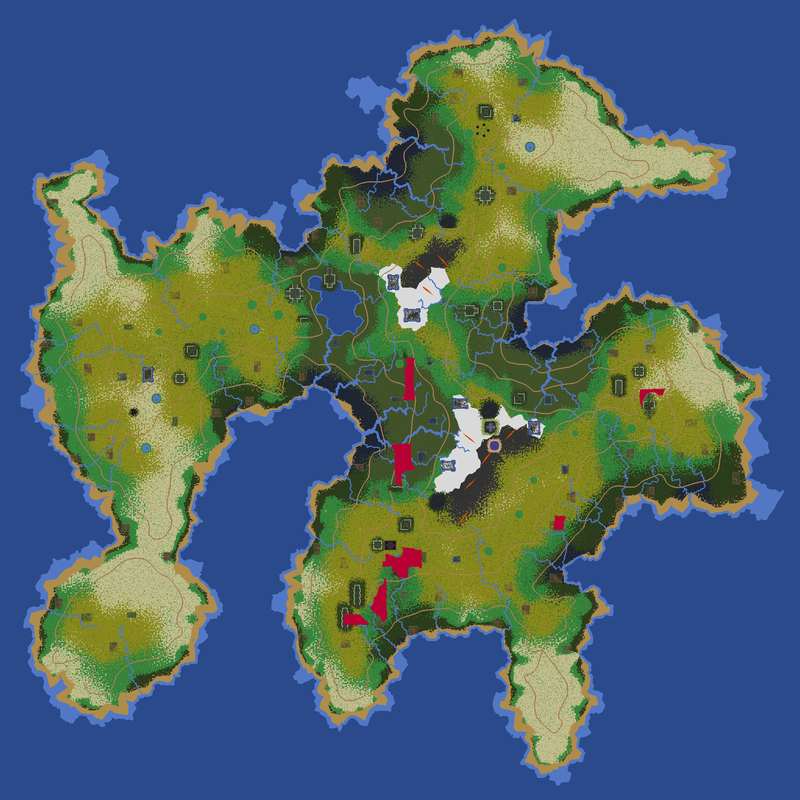 I blended the wiki image with the calculated biomes, and draped it over the 3d mesh. Although the maps look nicer with the calculated biomes, the blend allows us to see the set pieces and other features from the wiki images. I think the new rendering is much better at showing where the mountain ranges (godlands) are. Things to try: open the Controls on the right and rotate the map using rotate_z. Try varying mix to see what the map generator is producing (mix=0) or what the wiki image provided (mix=2). Try changing the distort parameters to see weird stuff that wasn’t in the rotmg map generator. Try changing the outline parameters to see more texturing in the valleys. Try changing either d parameter to change the snow/lighting on mountain peaks.